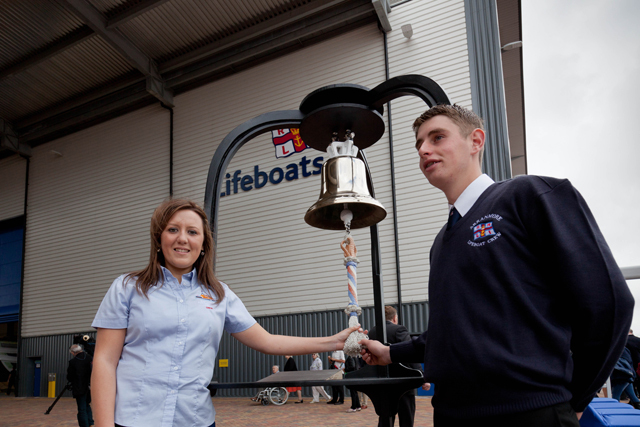 Two young RNLI volunteer lifeboat crewmembers rang a bell eight times to declare the new All-Weather Lifeboat Centre (ALC) officially open today. The new £24million, purpose-built facility at the charity’s headquarters in Poole will enable the production, maintenance and refit of the all-weather lifeboat fleet under one roof for the first time in the organisation’s 191-year history. The honour of officially opening the ALC went to the two youngest fully qualified all-weather volunteer lifeboat crew: 18-year old John McDermid from Donegal, Ireland and Caryl Jones, aged 20, from Gwynedd, Wales. The new facility, which covers a floor space of 5,000 square metres, has taken more than two years to build, will provide 90 new jobs and save the RNLI an estimated £3million a year. Hundreds of people attended today’s ceremony including local dignitaries, members of the public and supporters of the RNLI. As the bell rang, the doors to the new facility were raised open. The National Anthem and Phil Coulter’s Lifeboat Anthem ‘Home from the Sea’ were played to mark the occasion. RNLI chief executive Paul Boissier said the bell being rung was the start of a new tradition, which would continue every time a new lifeboat enters the water. He said: ‘It really is such a proud day for our charity. 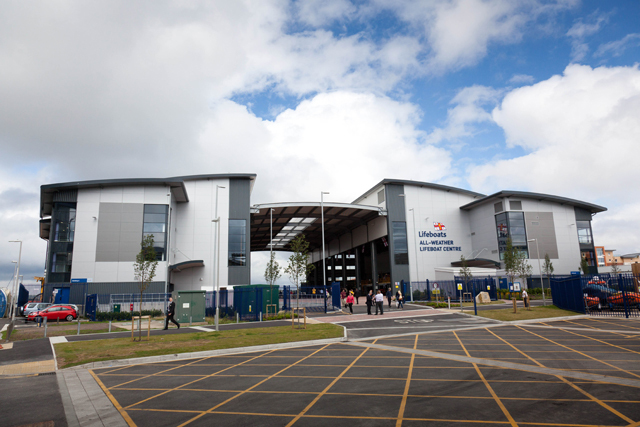 Now in addition to the training college and support centre, the site houses the ALC, which was commissioned by RNLI trustees to meet future all-weather lifeboat supply. Mr Bossier said as the charity’s lifeboats had become increasingly advanced over the years, it had made the competitive tendering process ineffective or impossible. The pool of suppliers able to produce lifeboats to the charity’s exact specifications had reduced dramatically and fewer boatbuilders to choose from meant less control over quality and cost. Green Marine in Lymington became the single supplier of composite hulls and the charity took over this facility in 2009. When it looked like the ‘fit out’ side of the lifeboat production process was going the same way, the charity decided to take action. Mr Bossier said the ALC was an ‘ambitious solution’, which had been made possible by the charity’s own ‘efficiency-making savings’ and supporters donating the remaining £5million needed. He added: ‘I would like to emphasise how grateful we are to those of you who have helped us to build this centre. RNLI head of construction and refit Angus Watson said the existing staff from the Lymington site were ‘excited’ to be moving to the new purpose-built facility – bringing the total number of production employees to 150 when the site is fully operational, plus 70 other staff including the quality team and design engineers. The new boatbuilding centre, which will allow the charity complete control over design, cost and production time, began operating in March this year. 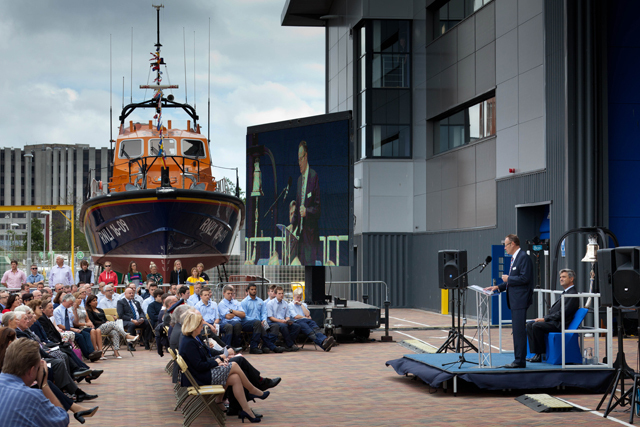 He added: ‘We are very proud to be officially opening The All-Weather Lifeboat Centre. It is an impressive facility which will allow the charity to build six Shannon-class lifeboats a year and maintain our other all-weather boats. The building itself includes some impressive features including: Three spray booths used to apply primer, coats of paint and antifoul to the lifeboats, Moveable platforms which will improve ergonomics and efficiency for accessing fit-out and refit lifeboats and a visitors centre allowing members of the public to watch the charity’s lifeboats being built. In addition to this PV panels on the roof of the ALC combined with the PV provision on the rest of the RNLI campus means that up to 8% of the RNLI’s energy requirements can be provided by the sun. The RNLI’s 2015 Open Weekend, which takes place tomorrow – Saturday 22 August – and Sunday 23 August, will give everyone the opportunity to tour the world-class boatbuilding factory, and the charity’s training facilities – the Sea Survival Centre and RNLI College. Between 10am and 5pm, visitors can meet the RNLI people who crew the lifeboats, who lifeguard the beaches and who work locally and globally to reduce coastal fatalities. The Open Weekend is free to attend, with a suggested donation of £2.